In 1975, in-state tuition at the University of Rhode Island was less than $1,000. The drinking age was 18, and the University boasted three on-campus bars, one dining hall, only a few residence halls and Chafee was the newest building on campus. It was the year that Warwick native Kathleen Briggs moved into a suite in Dorr Hall, where she lived with six other women who would become much more than just roommates and college pals. Denise DeFini, of Long Island, New York; Julie Dolan, of Bethesda, Maryland; Sue Carnevale, of Cranston, Katherine Blair, of Cape Elizabeth, Maine; Ellen Shalvey, of Warwick; and Alice Mullowney, of Ridgewood, New Jersey initially befriended one another in Weldin Hall, where they all lived. 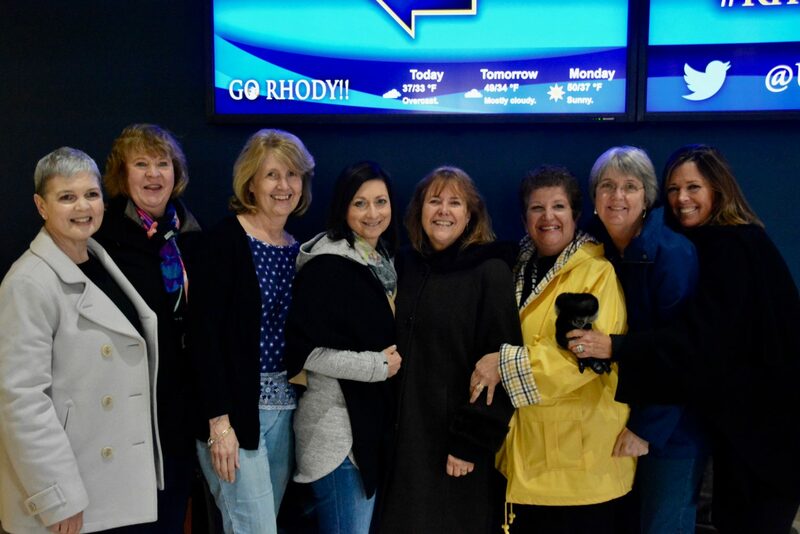 All members of the graduating class of 1977, they also grew close to their Resident Advisor, Denise Boule, of Cranston, a graduating senior at the time. The seven clicked instantly, and through frequent visits from Boule, the eight of them became best friends and their living situation definitely cemented this bond. “[Or] the Twinkies, the broken hearts,” Mullowney added. After graduation, the group wanted to make sure they didn’t lose touch. As they all planned to follow their respective paths, they knew they wanted to maintain their bond. But in a time before cell phones, social media and the internet, staying in touch was tricky. It was Boule who came up with a solution: Every April Fool’s weekend the women would get together for an annual reunion full of laughter, nostalgia and great food. This tradition stuck, and they’ve been getting together annually for the last 40 years. To celebrate this landmark in their friendship, this April they returned to the URI campus together for the first time since their graduation. Needless to say, they’ve noticed some pretty significant changes. Students didn’t have microwaves, computers or even telephones in their dorms. Dorr Hall was set up in a suite style, with a living room where today’s balcony rooms are, and bedrooms and bathrooms on either side, one with a tub. Ram’s Den was a major hub where people would drop by in between classes, and Butterfield was the only dining hall open. Carnevale remembers the food being particularly bad, though. “The pot roast had a green tinge to it,” she laughed. There were no other local dining options, though, as the Kingston Emporium hadn’t been built yet. On the weekends, the dining halls were closed, and many students didn’t have cars. Shalvey remembers URI as a suitcase school, as many people went home on the weekends. The worst part about living on campus, she recalled, were the middle of the night fire drills, but Thursdays were still the nights to party. The group was particularly fond of the fraternity parties and Greek Week events, but also just loved to hang out and talk. Admittedly, though, the group says they’ve had even more fun since they’ve graduated. Their first reunion was in 1978, the spring after graduation. It was in Bethel, Connecticut, at Boule’s house. They made a turkey dinner that Briggs said “took hours” because it was the only meal they all knew how to cook. Over the years they’ve gone to Massachusetts, Tennessee, Florida, Maine, Kentucky and other places, too. They’ll sometimes go sightseeing, reminisce about college days, and talk about their lives. They’ve had a few pretty eccentric reunions, too. “Muggins (Blair) was getting married so I picked everyone up in a stretch limo at the airport, and for a two and a half hour drive to our location, we had a bridal shower in the back of the limo,” Dolan said. They even turned a white URI baseball cap into a “wedding hat” with a veil and some bows to commemorate the occasion. Over the years, they’ve stuck together “through thick and thin,” Boule said. “This group doesn’t judge,” she added, which makes it possible for all of them to remain so close. Today, all eight women live pretty far apart. Some are local to Rhode Island, but others live in Florida and Boston. They’ve pursued different careers, had children and gotten married. Many of them don’t talk as much throughout the year, but have stayed in touch through letters, phone calls, and email. Now they text and are connected on social media, but many of them just exchange Christmas cards.